Superficial or lunchtime peel: Alpha-hydroxy acid or another mild acid is used to penetrate only the outer layer of skin to gently exfoliate it. The treatment is used to improve the appearance of mild skin discoloration and rough skin as well as to refresh the face, neck, chest or hands. Medium peel: Glycolic or trichloroacetic acid is applied to penetrate the out and middle layers of skin to remove damaged skin cells. The treatment is used to improve age spots, fine lines and wrinkles, freckles and moderate skin discoloration. It also can be used to smooth rough skin and treat some precancerous skin growths, i.e. actinic keratosis. Deep peel: Tricholoracetic acid or phenol is applied to deeply penetrate the middle layer of skin to remove damaged skin cells. The treatment removes moderate lines, age spots, freckles and shallow scars. Patients will see a dramatic improvement in skin appearance. The procedure is used on the face and only can be performed once. What should first be done before considering a chemical peel? A thorough evaluation by a dermatologic surgeon is imperative before embarking upon a chemical peel. · Have taken Accutane in last six months. · Have psoriasis, eczema, dermatitis or rosacea. 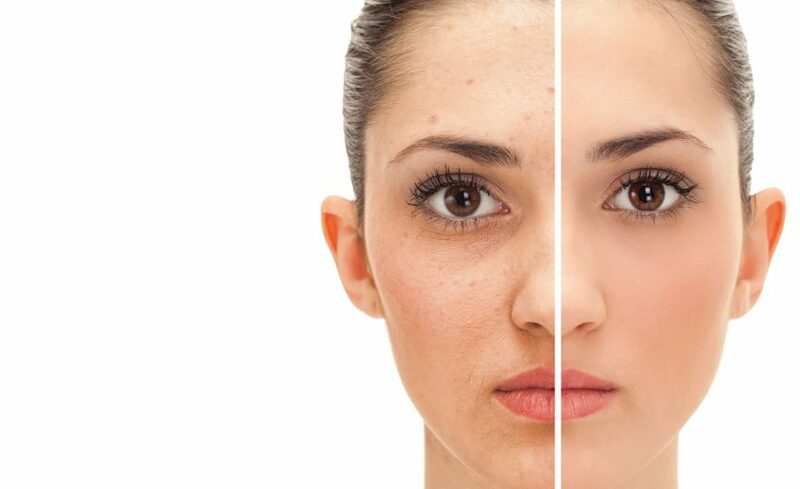 · Have used Retin-A, Renova, prescription skin care products, products that contain ascorbic acid, bleaching or skin-lightening agents or other acid-based products in the last 48 hours. Chemicals peels sting but do not cause a great deal of pain. The gentlest peels use alpha-hydroxy, glycolic, lactic or fruit acids are also gentle. They may cause stinging, redness, irritation and crusting but as the skin begins to adjust all these problems will lessen. Trichloroacetic acids are used for stronger peelings. They remove wrinkles, superficial blemishes and pigment problems. Phenol is the strongest of all treatments and removes deep lines and wrinkles on the face. These type of treatments sting more than those with the gentler acids. After the treatment there may be redness, swelling and irritation but the use of creams and gels will reduce these effects. Also the doctor may prescribe medicines that will help relieve the problems after the peel. What are the complications or potential side effects of a chemical peel? · Temporary or permanent change in skin color, particularly for women on birth control pills, who subsequently become pregnant or have a history of brownish facial discoloration. What can I expect after having a chemical peel? · Superficial peels require one to seven days to heal. Treated skin will initially be red and may scale. Lotion or cream should be applied until the skin heals, followed by daily use of sunscreen. Makeup can usually be worn the next day. · Medium peels require seven to 14 days to heal. Treated skin will initially be red and swollen. Swelling worsens for the first 48 hours. Eyelids may swell shut. Blisters may form and break. Skin crusts and peels off in seven to 14 days. Skin must be soaked daily for a specified period, followed by ointment application. Antiviral medication is taken for 10 to 14 days. Mild lotion or cream may be applied. Avoid all sun exposure until healing is complete. Camouflage makeup may be worn after five to seven days. A follow-up appointment will be necessary to monitor progress. · Deep peels require 14 to 21 days to heal. The treated area will be bandaged. Skin must be soaked four to six times daily, followed by ointment application for the first 14 days. Afterwards a thick moisturizer is applied for the next 14 days. Antiviral medication is taken for 10 to 14 days. Mild lotion or cream may be applied. Avoid all sun exposure for three to six months. Camouflage makeup may be worn after 14 days. Several follow-up appointments will be necessary to monitor progress. Sun exposure and smoking after a chemical peel must be avoided because they can cause unwanted side effects, including infection and scarring. Radiant Skin Clinic is a Dermatology Clinic in Civil Lines, Jaipur. Some of the services provided by the clinic are: Laser Hair Removal, Hair Transplant, PRP Therapy, Steam Cell Therapy and Chemical Peeling and much more.